The Underbelly of the American Dream. 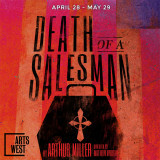 Standing ovations often are not well-deserved; however the truly magnificent production of Arthur Miller’s 1949 Pulitzer Prize winner Death of Salesman, at Artswest, more than deserved the standing ovation, it received at the curtain call on Saturday night. Artistic Director Mathew Wright, took this superb well-constructed play, found an outstanding cast and kept me riveted for three hours. It is clearly the best show I have seen all year. To begin with , there is the script, with an individual and family tragedy at its core as well as psychological, sociological, historical and important cultural dimensions. I would say that perhaps no other play describes the disturbed relationship Americans have towards success. Our hero, Willy Loman’s relationship to success is not only pathological but classically tragic. First generation middle class, Willy Loman, is a travelling salesman, who at 63 is starting to fall apart, and has been reduced to selling purely on commission. Suffering from low-self-esteem, he wavers between self-aggrandizement and self-loathing, never thinking that life is about finding enjoyment and fulfillment in what you have, in celebrating the successes you have achieved, however modest and in finding internal happiness. It doesn’t take Sigmund Freud to point out that his enslaving yearnings for external success, as the only means to alleviate his poor self-esteem, actually sabotages any chance he had for great success. His obsessive elevated ideas about himself prevent him from actually finding fulfillment in the things he enjoys-working with his hands, gardening, carpentry and substantial home remodels. He has raised two sons, in their 30’s who he loves in a narcissistic way. As long as he believes they are following his definition of the path towards success, he loves them; otherwise they are just beneath contempt. As the play opens, he comes home early from a routine business trip because mentally he is not all there, his mind has been wandering. It is an open secret, that he is contemplating suicide because then his wife can cash in on his life insurance policy. His drifter son, Biff, a once promising athletic scholarship recipient, is home visiting from the West. His other son, Happy, a handsome womanizing chief assistant to the assistant chief in some sort of Manhattan sales operation, is temporarily staying with the family. Over the next two days, Willy gets fired just before the last mortgage payment is due. Concurrently Willy has tried to persuade an initially unwilling Biff to become a big-time entrepreneur while preaching poisonous self-aggrandizing advice about getting a loan from a former boss. Biff would rather everybody stop the denial, accept that Willy and Biff are just ordinary people and that Biff’s life in the open air as a farm-hand makes him happy and working in an office does not. Happy would rather maintain the denial in the family and has some pretty dishonest and immoral ways of compensating for his lowly status in the business world. Everybody tries to discuss things, but fights just erupt. Instead of good communication skills and compassion, everybody substitutes shame and blame accusations, whose poison pervades the house like a bad odor. One of the things that is revealed is that Willy’s values have not served his sons well; he not only overlooked their dishonesty, he encouraged it. Throughout their upbringing, he mocked their studious neighbor, as well as subverted any sense of personal responsibility or modesty. Most importantly, he did not teach their kids how to recover from so-called failure and disappointment. .
As Willy Loman, actor David Pichette, turned him into a highly sympathetic character, rather than just Willy Loathsome. The demands of the role are considerable, with several long monologues, lightening flashes of intensity and emotional depths. In addition the character has a tenuous grasp of reality at best. Pichette managed this without caracteur or gimmicks andas mad Willy became an American Everyman. I would guess that every single person in the audience could identify with Willy’s struggles as a result of Pichette’s tour de force performance. Biff and Happy, the Loman Brothers, played by Drew Highland and Kyle Anton Johnson respectively, played their parts expertly. They had all of Willy’s arrogance in the flashbacks, but unlike most men of the pre-Oprah generation, they had sensitivity, emotional depth and psychological insight about their parents as well as their own situations. Their chemistry with each other was electric,while Biff’s with his father was positively nuclear. What was so outstanding about this production was that every one of the minor characters were of the same caliber as the leads. As the neighbor Charley, Tee Dennard played a wise old sage, whose definition of success is more modest than Willy’s and who consequently achieves a lot more, and is far more successful as a father to his son Bernard. Other minor characters who stood out were: Jason Sanford who played Howard, the boss who fires Willy, not without reason, but certainly without any compassion or severance package. Sanford struck just the right tone of smugness, bewilderment and a sense of entitlement, which those of inherited wealth wear so well, when he fired Willy and shreds him of what little is left of his dignity. Dedra D Woods and Emily Jo Testa, who played multiple parts both added significantly to this excellent production. All the elements in the play served the production well, costumes, the lighting , the set, the 50’s music and especially the directing by Matthew Wright. As this is not an easy play to direct, it demands not only highly capable actors but a director who can mold the cast. It is well worth a trip to West Seattle to see this show. N.B. some of the shows are already sold out.